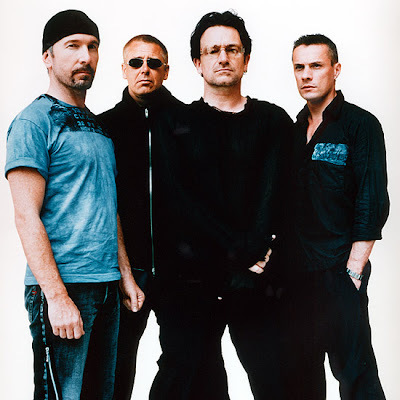 Seeing U2 in concert is one of the things in life that makes me happy beyond words! My husband and I are pretty much obsessed with U2. I fell in love with them back in high school and even have a fond memory of skipping school early one day with one of my best friend's Christine to go see them perform the Lemons Tour. It's been 4 years since their last tour...Vertigo...and now they are performing their 360 Tour (a stadium tour). We went to see them Wednesday night at Giants Stadium...and they were AMAZING!!! If you haven't heard their latest album (No Line On The Horizon)...it's great! How is is that they can continue to put out album after album of awesome music? Their opening act was a band called Muse (which we didn't get to hear because we got to the stadium at 8:30pm and they went on at 7pm). Bono did say that Muse was #1 on You Tube that day and that Muse is the next big thing! 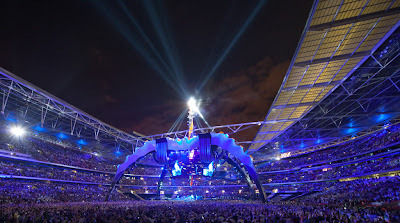 U2 went on the stage at 9pm and sang straght until 10:52pm when the lights went off and they walked off the stage. I'm guessing that either a lot of people thought they were done, or they were just tired and wanted to leave early, but the stadium cleared a bit. U2 wound up getting back on the stage literally 3 minutes later and sang 3 more songs. These guys are awesome...24 songs in total for the night without any breaks. They got everyone up out of their seats and dancing. One thing I did notice was that the audiecne was sort of older (I guess we are kind of included in that crowd now too :-( But, my point is is that I didn't see any high school students...and I fell in love with them and went to their concerts in high school...so I was surprised by this. Just a couple of things to say about the night that completely annoyed me to no end! Giants Stadium is the worst to get to! It's no where near The New Jery Turnpike...you have to take about three different highways to get there once you get off the turnpike. The sings are terrible...and the place was mobbed! If you don't like crowds...this is certainly not the place for you! You had to pay $25 for parking and get in a huge line to be frisked and have your purse checked. The forecast called for rain on Wednesday (even though it held up- only lightly rained for literally five minutes), but security confiscated umbreallas at the door...lots of people were not ahppy about that. So note to self...never bring an umbrealla- even if it's down pouring! Sorry for my ramble, but had to get that off my chest. I wonder how Giants fans do it every Sunday during football season?